Comments: Used Rocksim file prepared by GA Dean as basis for this file. Changed nose cone to Sears-Haack type, which more accurately reflects the part than "parabolic" from the original file. Used original engine tube from Estes kit, but changed placement of thrust ring to accomodate "E" engines. We really enjoyed our original Blue Ninja kit, so decided to make this modified version of it. 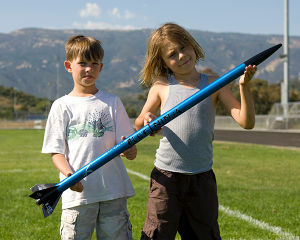 Although this is a much larger rocket, it performs similarly to the original Blue Ninja on a D12-5 Estes standard engine. But with the modified engine mount, it takes an E9-6 which will send it over 1,100 feet and give you a perfect at-apogee recovery deployment. Build it and enjoy it. Designer: Estes (Kit #1300). 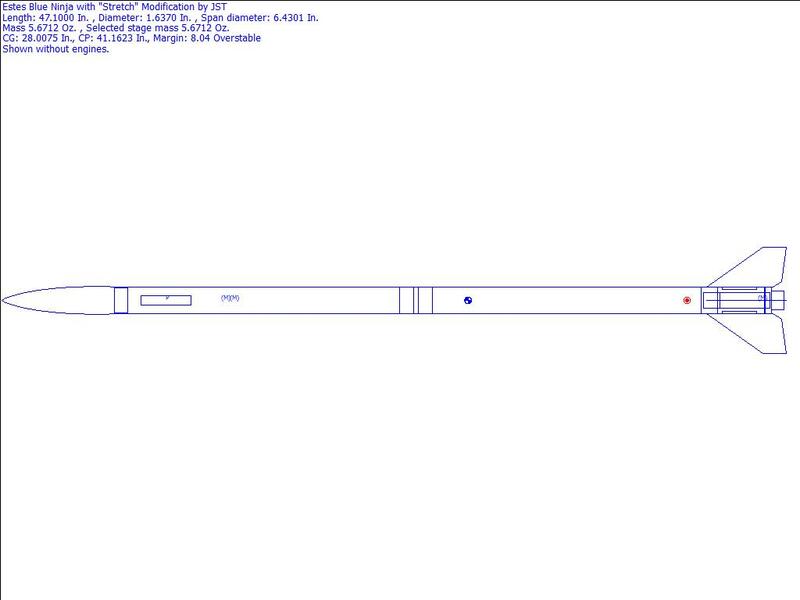 Modified by Jarrett Gorin and Spencer Clark.